If you are just starting out in affiliate marketing, getting that first sale can be quite elusive. With so many options available, products to choose from, ways to promote, forums, ebooks, etc... most people suffer from analysis paralysis. I recently read that achieving a goal is like a big giant sphere with you standing in the center of it. Success is defined as reaching the surface. Now what is the quickest way to the surface? So many individuals wanting to make it in affiliate marketing start moving towards the edge, then they get sidetracked and move in the opposite direction, only to change course again after reading the latest ebook, or learning about some new method in a forum. I know, cause this was once me. Jumping from idea or method to the next, never to really give any of them my full effort. I still do this sometimes, but it wasn't until I made a plan and stuck to it, that I began to see profits. Is this you? The quickest way to the surface of the sphere is a straight line. This requires focus. I describe many marketing methods in our affiliate resource center; whether it is article marketing, pay per click, ppv, SEO, etc... choose a method, develop a plan and then stick to it. I guarantee if you do this you WILL be successful! 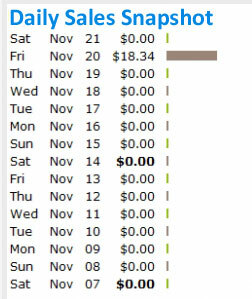 There is nothing like that first sale ... "Yesterday i logged into my clickbank account and lo and behold I got my first sale! ... my hard work is starting to pay off ..."